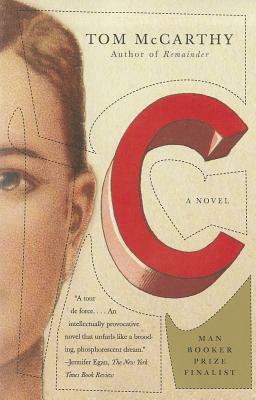 Opening in England at the turn of the twentieth century, C is the story of Serge Carrefax, whose father experiments with wireless communication while running a school for deaf children. Serge grows up amid the noise and silence with his brilliant but troubled older sister, Sophie: an intense sibling relationship that haunts him as he heads off into an equally troubled larger world. As Serge goes from a Bohemian spa to the skies of World War I, and from a German prison camp into the tombs of Egypt, we follow his life through the tumultuous course of the nascent modern era. Tom McCarthy—acclaimed author of Remainder—has created a truly singular character, and a world that sparkles with historical breadth and postmodern originality. Tom McCarthy was born in 1969 and lives in London. He is known in the art world for the reports, manifestos, and media interventions he has made as General Secretary of the International Necronautical Society (INS), a semi-fictitious avant-garde network. His previous books are Remainder and Tintin and the Secret of Literature.